Richard Parsons was born in Macon, Georgia. He enlisted in the U.S. Air Force in August 1985, and completed Basic Training and then the Security Specialist Course at Lackland AFB, Texas, in December 1985. His first assignment was as a Fire Team Member/Leader, Unit Mobility NCO, Quality Control Evaluator, and then NCOIC of Training for the 347th Security Police Squadron at Moody AFB, Georgia, from December 1985 to May 1993. 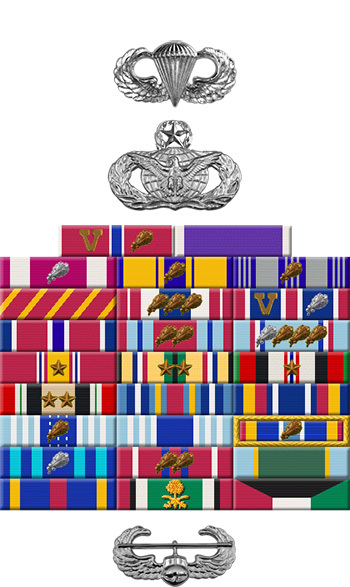 During this time, Sgt Parsons completed Ranger School at Fort Benning, Georgia, in 1989, and participated in Operation Desert Shield and Desert Storm in 1990-1991. His next assignment was as an Alarm Monitor, Weapons Storage Area Supervisor, and then NCOIC of Training and Resources with the 48th Security Police Squadron at RAF Lakenheath, England, from May 1993 to April 1997, followed by service as Operations and Training NCO for the 820th Security Forces Group at Lackland AFB from April 1997 to April 2000. MSgt Parsons served as NCOIC of Operation and Training, NCOIC of Standards and Evaluation, and then as Operations Superintendent of the 820th Security Forces Group at Moody AFB from April 2000 to September 2003, and then as Operations Superintendent and Squadron Superintendent of the 822nd Security Forces Squadron at Moody from September 2003 to December 2006. His next assignment was as Group Superintendent of the 820th Security Forces Group at Moody AFB from December 2006 to December 2007, followed by service as Security Forces Manager with Headquarters Air Force Special Operations Command at Hurlburt Field, Florida, from December 2007 to May 2008. 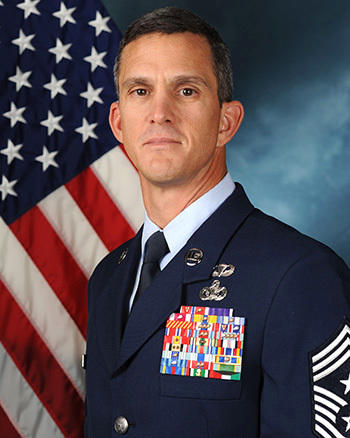 CMSgt Parsons next served as Command Chief Master Sergeant of the 505th Command and Control Wing at Hurlburt Field from May 2008 to June 2009, and then as Command Chief Master Sergeant of the 23rd Wing at Moody AFB from June 2009 to December 2010. He served as Command Chief Master Sergeant of U.S. Air Forces Central Command in Southwest Asia from December 2010 to November 2011, and then as Command Chief Master Sergeant of Air Combat Command at Langley AFB, Virginia from November 2011 to August 2014. CMSgt Parsons also completed the U.S. Army Air Assault School at Fort Campbell, Kentucky, in 1998, and U.S. Army Jump School at Fort Benning in 1999. Senior Master Sergeant Richard A. Parsons distinguished himself by heroism as Operations Superintendent, 447th Expeditionary Security Forces Squadron, 447th Air Expeditionary Group, 332d Air Expeditionary Wing, Baghdad International Airport, Iraq, while engaged in ground combat against an enemy of the United States on 24 March 2004. On that date, Sergeant Parsons was a convoy commander escorting military personnel, contractors, and equipment from Balad Air Base to Baghdad International Airport along Main Supply Route Tampa, when his convoy was ambushed by more than four heavily armed enemy forces. As the lead team came under intense weapons fire, one service member was mortally wounded and two others were seriously wounded. Sergeant Parsons reacted immediately and disregarding his own safety, maneuvered his unarmored vehicle into position, directed his forces to engage the enemy with heavy rifle and machine gun fire, and returned fire with thirty-five rounds from his M-4 rifle. Once he believed the main fight was over, he called the medic forward and began to establish 360-degree security. He was then struck by a responding vehicle and although injured, Sergeant Parsons continued to ensure his forces maintained security while the squadron's medic treated the two wounded military members. His actions directly contributed to three enemies killed in action, one wounded, and the capture of a substantial cache of weapons that included four automatic rifles, two handguns, hand grenades, three rocket propelled grenades, and over four hundred rounds of ammunition. Sergeant Parson's swift and courageous actions were critical to protecting the lives of more than one hundred people and mission essential equipment. By heroic actions and unselfish dedication to duty, Sergeant Parsons has reflected great credit upon himself and the United States Air Force.